Margaret Masterman was a pioneer in the field of computational linguistics. Working in the earliest days of language processing by computer, she believed that meaning, not grammar, was the key to understanding languages, and that machines could determine the meaning of sentences. She was able, even on simple machines, to undertake sophisticated experiments in machine translation, and carried out important work on the use of semantic codings and thesauri to determine the meaning structure of texts. This volume brings together Masterman's groundbreaking papers for the first time. 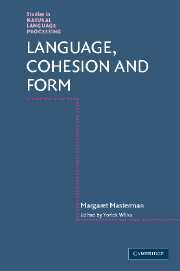 Through his insightful commentaries, Yorick Wilks argues that Masterman came close to developing a computational theory of language meaning based on the ideas of Wittgenstein, and shows the importance of her work in the philosophy of science and the nature of iconic languages. Of key interest in computational linguistics and artificial intelligence, it will remind scholars of Masterman's significant contribution to the field. 5. What is a thesaurus?